Owners: Ente Vasco de la Energia, Repsol-YPF, British Petroleum, and Iberdrole S.A.
Overview: In Spain, the demand for imported natural gas and electricity has been rapidly increasing, a trend that is anticipated to continue for years to come. To augment the country's energy supply, the Spanish government has decided to build additional liquefied natural gas (LNG) and combined cycle gas turbine plants. 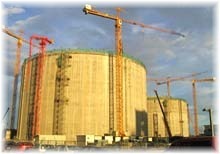 Located in Bilbao, this plant consists of Bahia de Bizkaia Electricidad (BBE), an 800-MW gas fired combined cycle power station, and Bahia de Bizkaia Gas (BBG), a regasification facility with regasificators having a total capacity of 2.7 billion cubic meters. Overview: The Bahia de Bizkaia Plant is one of the most significant power projects to be carried out in this region. The project has been led and financed by Ente Vasco de la Energia, Repsol-YPF, British Petroleum, and Iberdrole S.A., with the total investment coming to approximately 600 million euros. Both facilities aim to have high availability. The field-proven CENTUM CS 3000 distributed control system (DCS) ensures this by enabling the control and monitoring of the entire BBE power station. The BBG regasification facility is designed to operate 24 hours a day, 365 days a year without having to be shut down for maintenance. Yokogawa's highly reliable CENTUM CS 3000 DCS offers a high degree of redundancy that contributes to the entire plant's high availability. At the BBE power station, General Electric Company gas and steam turbines have been installed and are controlled by its turbine control system.The electrical equipment of the power station is controlled by another vender's system. With its Unified Operator Interface (UOI), Yokogawa's CENTUM CS 3000 enables the seamless operation of each of these control systems. With the UOI solution, all of the actions required for the operation, management, and maintenance of turbines, the heat recovery steam generator (HRSG), and the balance of plant (BOP) and electrical controls can be carried out from a single operator interface. The UOI also eliminates the requirement for operators to master the operation of multiple systems. 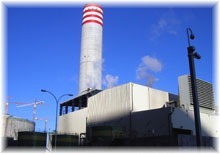 The BBE power station is capable of working both at base load and at partial loads, which provides flexibility in the plant operation. In addition, to reduce the start-up time, 100-percent-flow by-passes were designed to start the gas turbine and the HRSG individually without starting up the steam turbine. The Yokogawa DCS for which the Spanish engineering company Siemsa Notre S.A. (SIEMSA) fully implemented the above operation logic has steadfastly supported the safe plant operation and smooth startup. The SIEMSA engineer commented, "We appreciate CENTUM CS 3000's operationality and system reliability. With the UOI solution, the DCS controls use the same HMI system as the turbine and electrical control system, and there is no need for a dedicated communication gateway and separate screens. This significantly reduces the engineering time and costs."